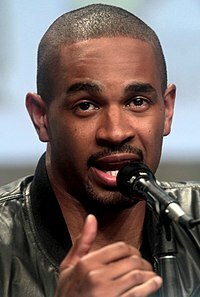 Damon Kyle Wayans Jr. (born November 18, 1982) is an American actor, comedian and writer most widely known for starring as Brad Williams in the ABC sitcom Happy Endings for which he was nominated for the Critics' Choice Television Award for Best Supporting Actor in a Comedy Series in 2012 and as Coach in the Fox sitcom New Girl. In 2014, he starred in the comedy film Let's Be Cops, and provided the voice of Wasabi in Big Hero 6. He is the oldest son of actor comedian Damon Wayans, and nephew of Keenen Ivory Wayans, Shawn Wayans, Kim Wayans and Marlon Wayans. Wayans was born in Huntington, Vermont. He is a member of the Wayans family, the son of Lisa Thorner and actor Damon Wayans. He is the eldest of four children: Michael, Cara Mia, and Kyla. Wayans made his film debut when he was cast in his father's feature film of 1994, Blankman, playing Young Kevin. He later appeared on his father's sitcom My Wife and Kids as John, one of Junior's friends. He later worked as a staff writer on the series. In fact, the character of Junior was loosely based on Wayans Jr. himself. He appeared in and served as a writer on The Underground. Wayans Jr. also surprised audiences when he garnered a standing ovation during his debut appearance on Def Comedy Jam. He starred in the Wayans family comedy Dance Flick as the film's main character, Thomas. From April 2011 to May 2013, Wayans starred as Brad Williams, one of the lead characters in the ABC comedy series Happy Endings, alongside Eliza Coupe, Elisha Cuthbert, Zachary Knighton, Adam Pally, and Casey Wilson. Despite critical acclaim and a cult following, the show was cancelled by ABC after concluding its third season on May 3, 2013. Wayans was nominated for "Best Supporting Actor in a Comedy Series" at the NAACP Image Awards and Critic's Choice Television Awards for his work on Happy Endings. On May 16, 2011, the Fox Network announced that it had picked up the Zooey Deschanel anchored comedy New Girl, which featured Wayans in the supporting role of Coach. However, Happy Endings had already been picked up for a second season on rival network ABC. The producers of New Girl initially planned to recast Wayans' role, but later decided not to recast nor reshoot the pilot episode in which he appeared. Instead, starting with the second episode, Wayans' character was substituted with Lamorne Morris, playing the role of Winston, a former roommate who had been pursuing a professional basketball career in Latvia. With Happy Endings cancelled after its third season, it was announced in July 2013 that Wayans would return for at least 4 episodes of New Girl in the upcoming third season. In November 2013, it was announced that Wayans would remain on the show for the rest of Season 3. In May 2014, it was announced Wayans would return as a series regular for season four. Wayans has two daughters with ex girlfriend Aja Metoyer. In 2016, Wayans married Samara Saraiva. 2012 NTSF:SD:SUV:: Garett Episode: "The Real Bicycle Thief"
2016 Brooklyn Nine-Nine Detective Stevie Schillens Episode: "The 9-8"
2017 Curb Your Enthusiasm Police Officer Episode: "A Disturbance in the Kitchen"
^ "Signal Staff and Wire Services", November 18, 2011. Santa Clarita Valley Signal, "Today in the SCV: Friday, Nov. 18, 2011". Accessed November 29, 2011. ^ Damon Wayans Biography (1960— ). Filmreference.com. Retrieved on December 30, 2011. ^ "'Happy Endings': Damon Wayans Jr. Talks Season 3, Negative Cast Rumors". The Huffington Post. Retrieved July 20, 2015. ^ "Person Details for Damon Kyle Wayans, "Vermont, Vital Records, 1760-2008" — FamilySearch.org". familysearch.org. Retrieved July 20, 2015. ^ "Wayans Believes in Stern Upbringing", contactmusic.com, April 30, 2004. ^ ABC Renews ‘Happy Endings’, Fox’s ‘New Girl’ To Recast Damon Wayans Jr. –. Deadline.com. Retrieved on December 30, 2011. ^ 'New Girl': Lamorne Morris Replaces Damon Wayans Jr. in Fox Comedy. Hollywood Reporter. Retrieved on December 30, 2011. ^ "Damon Wayans Jr. Reprising 'New Girl' Role for Season 3 Arc". The Hollywood Reporter. Retrieved July 20, 2015. ^ Hibberd, James (November 6, 2011). "'New Girl' scoop: Damon Wayans Jr. commits to whole season". adweek.com. Retrieved November 7, 2013. ^ "Dwyane Wade and Damon Wayans Jr. beef after Aja Metoyer baby mama drama? 'Happy Endings' actor 'doesn't want kids to get hurt,' how does Gabrielle Union feel?". Mstarz. Retrieved July 20, 2015. Wikimedia Commons has media related to Damon Wayans Jr. This page was last edited on 21 April 2019, at 16:15 (UTC).